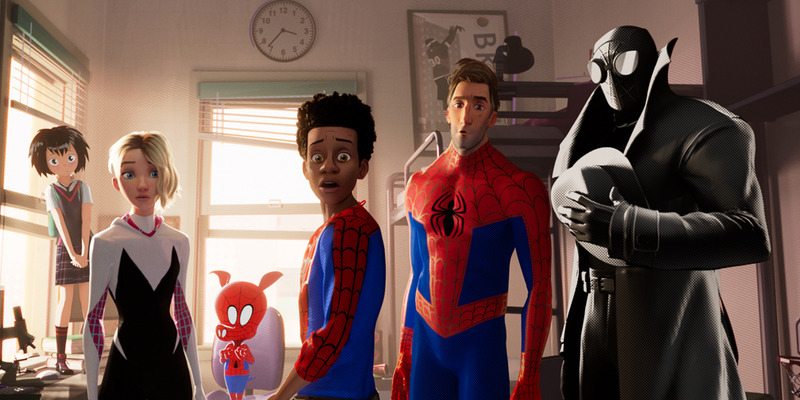 “Spider-Man: Into the Spider-Verse” has the perfect blend of geeked-out elements for the fanboys and a story structure that keeps audiences with less comic knowledge up to speed. On top of pulling off that feat, the movie’s comic-book-come-to-life look is beautiful. This is the best animated movie you’ll see this year. Turns out Sony isn’t through putting its sweet Marvel properties in theatres this year. 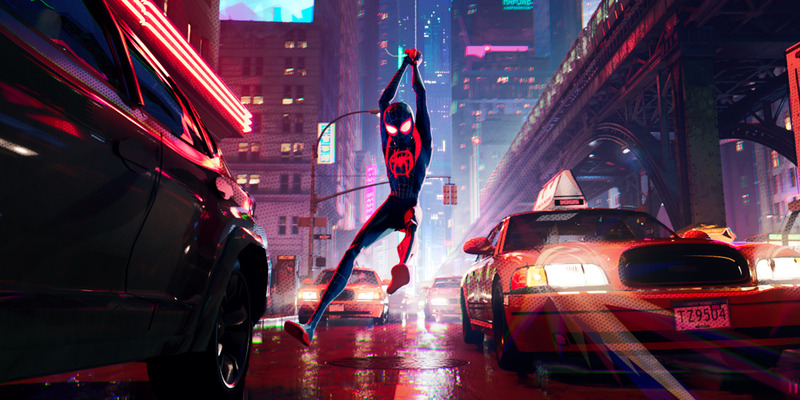 With “Venom” still making major coin around the world, the studio is searching for more with the animated movie, “Spider-Man: Into the Spider-Verse” (in theatres December 14). 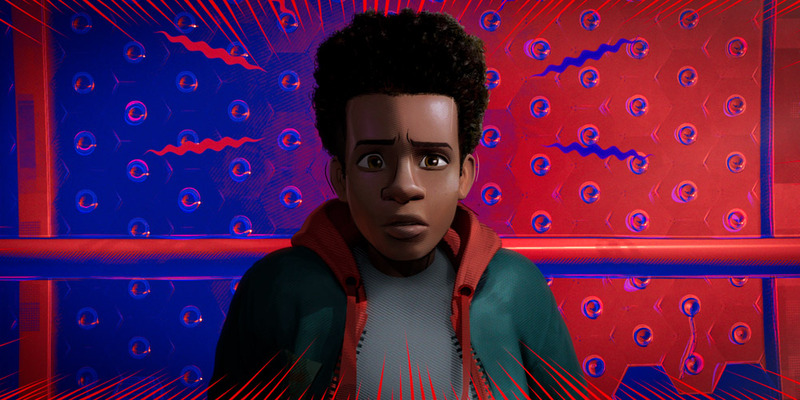 As the live-action Spider-Man franchise is successfully rebooting itself with Tom Holland as Peter Parker in Marvel Studio’s MCU, Sony went full geek with its animated introduction to Miles Morales. If you’re not up on your Spider-Man comics, Morales, an Afro-Latino teen, started being your friendly neighbourhood Spider-Man around 2011 in Marvel’s Ultimate Comics series. But “Spider-Verse” doesn’t stop there in introducing other folks who have taken on the great responsibility of being the iconic hero. Directed by Bob Persichetti (a longtime animator), Peter Ramsey (2012’s “Rise of the Guardians”), and Rodney Rothman (producer on “Popstar: Never Stop Never Stopping”), under the watchful eye of producers Christopher Miller and Phil Lord (Rotham and Lord also wrote the screenplay), “Spider-Man: Into the Spider-Verse” gives us a unique Miles Morales origin story by having him learn the superhero trade from a handful of others who also call themselves Spider-Man in other universes. Miles Morales (voiced by Shameik Moore) is just a high schooler in Brooklyn going about the usual things every teen boy experiences at this age. He’s trying to impress girls and not be embarrassed by his parents. But after being bitten by (you guessed it) a spider, Morales suddenly has superhero powers. And it’s just in time because Kingpin (Liev Shreiber) has opened a portal to other universes, and if Morales doesn’t do something about it, his universe will be destroyed. And this is when Peter Parker (Jake Johnson) shows up. But he’s a Peter Parker from another universe, one where he’s added a few pounds and is having relationship troubles with Mary Jane. Now stuck in Morales’ universe, Parker has to help so he can get himself back to his not-so-amazing life. Here’s where the writing really shines as Moore and Johnson play off one another to develop a chemistry for Morales and Parker that is the foundation of the movie. Once that’s established, the fun begins as even more Spider-Men appear. 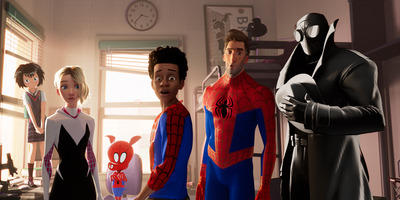 Spider-Gwen (Hailee Steinfeld), Spider-Ham (John Mulaney), Peni Parker (Kimiko Glenn), and Spider-Man Noir (Nicolas Cage) all get sucked into Miles’ universe from their own. And they all now have to battle Kingpin to get back home, though they aren’t too sure if Miles is up for the big showdown. Still finding confidence in his abilities (struggling to be himself instead of emulating how Parker or any of the others do their own kind of Spider-Man), will Miles be a liability? One of the movie’s major strengths is that it is a treasure trove for fanboys while not leaving the less comic-book savvy segments of the audience on the outside. And along with the movie’s beautifully told coming-of-age tale, visually it has a comic-book-come-to-life feel – all the way down to the “BANG!” and “SLAP” big letter text coming on the screen. The animation pops especially in the action sequences. It’s a movie that needs that huge screen treatment to fully appreciate. But just the story and funny dialogue – the latter of which we’ve come to expect from Lord and Miller, the minds behind everything from “The Lego Movie” to the Fox TV show “The Last Man on Earth” – is worth the price of admission. All this makes “Spider-Man: Into the Spider-Verse” the best animated movie of the year. From its look, to pulling off multiple character arcs without overwhelming the audience, to telling a story that’s actually worth following, the movie goes a step beyond any other animated movie released in 2018.